Mexican officials are warning of a serious public health threat tied to the 6,000 migrants currently camped in the border city of Tijuana. 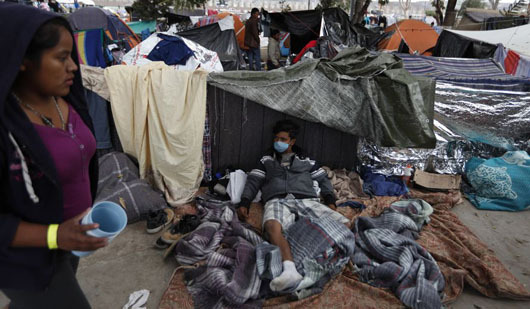 The Tijuana Health Department told Fox News that more than 2,200 of the caravan migrants are currently being treated for infectious diseases which include HIV/AIDS, tuberculosis, and chickenpox. There are four confirmed cases of HIV/AIDS, four cases of chickenpox, and three cases of tuberculosis, the health department said. The department also said that more than 100 migrants are infested with lice and there are multiple instances of skin infections. The health department also said it is concerned that the unsanitary conditions in the shelters could lead to an outbreak of Hepatitis. The 6,000 migrants are being housed at the Benito Juarez Sports Complex. The shelter is only rated to serve about 1,000 people. The health department said the thousands of migrants have just 35 portable bathrooms to use. Officials also had to place “No Spitting” signs in the shelter due to the rampant coughing and spitting taking place. Tijuana Social Development Director Mario Osuna Jimenez told USA Today that the city is scrambling to prepare additional indoor facilities to house the migrants. “We’re worried about the health and security conditions of families that are in the sports complex, so that’s why we’re getting ready,” the director said. Workers could be seen scrubbing a large events center on Tijuana’s east side in preparation for approval to open the facility for additional shelter space. In an Oct. 25 interview with Breitbart News, Dr. Jan Orient, executive director of the Association of American Physicians and Surgeons, warned of the coming threat to public health posed by the migrants.